Posted on 15, July 2016 by EuropaWire PR Editors | This entry was posted in Education, Entertainment, Environment, Science, United Kingdom and tagged artificial snow, cult TV series, Dr Wuge Briscoe, Hollywood blockbusters, Lizzie Mould, Snow Business, University of Bristol. Bookmark the permalink. 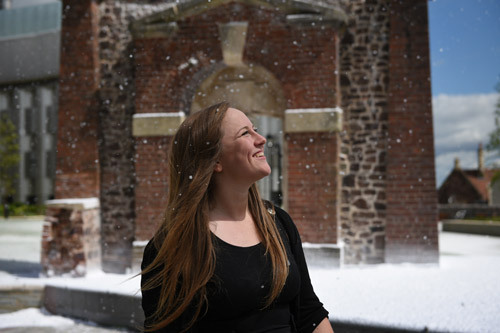 Snow developed in Bristol will soon be playing a starring role in Hollywood blockbusters and cult TV series thanks to the scientific expertise of a University of Bristol student. BRISTOL, 15-Jul-2016 — /EuropaWire/ — The cool creation has come about thanks to a partnership between the University and Snow Business, the world’s leading supplier of artificial snow and the creators of many famous snow scenes. Snow Business was keen to invent a new environmentally-friendly fluid which could be pumped out of its snow machines in the form of foam to create the effect of snowflakes. Student Lizzie Mould, who is studying for a Masters in Chemistry, rose to the scientific challenge with the help of Dr Wuge Briscoe, her project supervisor and a Senior Lecturer in Physical Chemistry at the University of Bristol. Lizzie has even landed a job at the Stroud-based company. A snowy scene was created on the University’s campus today to show it in action. Although Snow Business can’t reveal what films the ‘snow’ will appear in due to confidentiality, had it been available earlier in the year then it would have been used in the latest James Bond filmSpectre, Avengers: Age of Ultron and Star Wars VII The Force Awakens. Snow Business has previously created snow scenes for many major Hollywood blockbusters – including the Harry Potter films, Batman,Bridget Jones and The Chronicles of Narnia, plus Christmas favourites such as The Holiday and A Christmas Carol. The two products Lizzie’s created, called EcoFlake and ProFlake, have just been launched to Snow Business’ global network of suppliers and will be used to create gentle snow flurries, raging blizzards and everything in between. The project was made possible thanks to funding from the Impact Acceleration Account (IAA) – a scheme run by the Engineering and Physical Sciences Research Council (EPSRC) to aid innovation by helping businesses access the academic knowledge available at universities. Paul Denney, Head of Research and Development at Snow Business, said: “We had looked at developing the product ourselves but the chemistry involved was beyond our capabilities, which is why we approached the University of Bristol. “We weren’t totally sure what Lizzie and Wuge would be able to do, especially as we had a long wish list of characteristics, but they’ve surpassed all our expectations with the fluids they’ve created. Given its use in a wide range of situations, the snow not only needed to look realistic but to also fulfil a number of characteristics, such as not leaving residue on surfaces, being robust in different climates and not causing any adverse skin reactions. Lizzie began the challenge by looking at existing fluids on the market and understanding their formulas and physical properties. The underpinning science is closely related to the stability of thin liquid films – for example, how the foam forms and how long it holds its shape with the help of foaming agents and polymers. The area of chemistry in question relates to colloids and interface science – an area in which the University of Bristol has a long history of excellence. Lizzie also had to consider the effects of different chemicals on the environment and people’s skins, hence the creation of EcoFlake which is believed to be the most environmentally-friendly snow fluid on the market. Lizzie added: “Not only was I given the chance to formulate two new snow fluids at the research stage, but a full-time job with the company enabled me to see the process through to the end, being involved in the marketing and launch of the product. Professor Nick Norman, Head of the School of Chemistry at the University of Bristol, said: “This is a great example of a collaboration between academia and a small business in which the results of fundamental chemical research find direct application in the market place.